Were the early 1960s a golden age for health care? 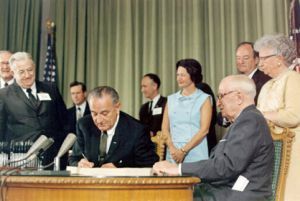 By Louis Jacobson on Friday, January 20th, 2012 at 5:58 p.m.
President Lyndon B. Johnson signs Medicare into law in 1965. How did U.S. health care work for seniors before that? We take a look at the statistics. Were the early 1960s a golden age for American medical care? To hear Ron Paul tell it, they were. "I had the privilege of practicing medicine in the early '60s before we had any government" involvement in health care, Paul said during the Jan. 19, 2012, Republican presidential debate in Charleston, S.C. "It worked rather well, and there was nobody out in the street suffering with no medical care. But Medicare and Medicaid came in and it just expanded." As soon as we heard this, we wondered whether his portrayal was accurate. We considered putting his comment to the Truth-O-Meter, but we decided that it was impossible to do so. We couldn’t prove a negative -- that "there was nobody out in the street suffering with no medical care" during that era. But we amassed research on the way to making that conclusion, most of it new to us. So we thought we’d share what we found about health care in the early 1960s. We’ll start with one quibble with part of Paul’s statement -- that the early 1960s was a period "before we had any government" involvement in health care. That’s certainly true of two big programs passed into law in 1965 -- Medicare, primarily for senior citizens, and Medicaid, for the poor. However, there were limited federal programs prior to 1965, notably the Kerr-Mills legislation (P.L. 86-778), which provided federal funding to states to cover medical costs for the indigent elderly. Kerr-Mills initially had been envisioned as serving 10 million people, but by 1965 -- when it was effectively supplanted by Medicare and Medicaid -- it only covered 264,687 Americans. So its impact was not that great. As for the broader picture of pre-1965 health care in America, Rosemary Stevens, a historian and sociologist at the University of Pennsylvania, wrote that "in the early 1960s, the choices for uninsured elderly patients needing hospital service were to spend their savings, rely on funding from their children, seek welfare (and the social stigma this carried), hope for charity from the hospitals or avoid care altogether." To double-check this assertion, we turned to a study by the Social Security Administration known as the Survey of the Aged. The survey was taken in 1963, and its findings were published in 1964 -- the "early '60s" Paul is talking about. One downside of the data is that it only looks at Americans 65 and older. So it doesn't give a full picture of how the health care system functioned in the early 1960s. However, as we’ll discuss later, senior citizens are a key to analyzing the state of American health care, since their health needs were, and remain, more acute than the overall population's. Overall, the study found that "the complex task of paying for necessary health services and providing adequate insurance for non-budgetable expenses remains beyond the economic capabilities of most aged persons." In all, slightly more than half of Americans 65 and older had health insurance at the end of 1962. That works out to 64 percent of couples, 49 percent of un-married women and 37 percent of un-married men. Dorothy Pechman Rice, a retired professor at the University of California at San Francisco who served as director of the National Center for Health Statistics from 1976 to 1982. The study found that nine out of 10 couples, and eight out of 10 elderly individuals, "assumed responsibility for their own costs without help from government sources or private voluntary agencies." Some paid from their own savings or with the help of insurance, and some could pay "only because doctors or hospitals adjusted their rates in light of the patient’s limited resources." Depending on the marital category, between 18 and 26 percent of seniors without health insurance relied on public assistance to pay some of the costs they incurred. The report concluded that such rates were "evidence of the fact that many of the aged simply cannot afford a hospital stay." Indeed, the biggest distinction the surveyors found was between elderly patients who needed to be hospitalized and those who didn’t. For instance, in a year without hospitalization, married couples incurred median medical costs of $173, or $1,289 in today’s dollars. In contrast, a year with at least one hospitalization meant incurring median costs of $938, or just short of $7,000 in today’s money. In other words, in the pre-1965 era, if you had to go to the hospital, the hospital may not have turned you down -- but if you were in the sizable percentage of Americans who had to pay all or much of the costs out of pocket, you’d be paying for your misfortune for years to come. The report concluded that "the cost of medical care is high for the aged, principally for those requiring hospital care. Many aged persons never recover from the economic effects of a single hospital episode. Unfortunately, the heaviest burden is likely to fall on those with the least resources. Those with insurance are better able to absorb the blow than those without such protection, but even for the insured, there is no present guarantee against dependency in old age caused by catastrophic medical expenses." None of this data demonstrates that there was "nobody out in the street suffering with no medical care" in the early 1960s. That’s why we’re unable to rate the accuracy of Paul’s statement on the Truth-O-Meter. As Paul has often noted, charitable care was an accepted part of the health care system during that period. "There were physicians who simply would not refuse care anyone who appeared in their offices and did God’s work," said Henry Aaron a health care specialist at the Brookings Institution, a Washington think tank. But even if the 1950s and early 1960s were a golden age for medical care as Paul suggests -- a notion Aaron derides as "delusional’ -- experts we talked to suggested that the era’s model isn’t of much use for policy discussions going forward. In the early 1960s, Aaron said, "health care was much less costly than it is today; and there was much less that doctors or hospitals could do for patients. It didn’t cost much for a hospital to let a heart attack victim lie in a bed or for a physician to stop by and prescribe nitroglycerin for someone with angina. It is rather different when pain in the chest calls for angiography and possibly for angioplasty and costly maintenance drugs. It is the rare physician today who can afford to give a full work-up to a person who presents with persistent chest pains, which calls for thousands of dollars worth of tests." EDITOR’S NOTE: After we published our story, we were able to obtain some additional statistics about pre-1965 health care usage, which we will provide here for the benefit of readers who may be interested in learning more. In a 1963 survey, patients from the general population were given a list of symptoms and asked whether they had been able to see a physician about them. Among those who reported "pains in the heart," 25 percent said they did not see a physician; for "unexpected bleeding" it was 34 percent; for "shortness of breath," it was 35 percent; for "abdominal pains," it was 31 percent; for "repeated vomiting," it was 40 percent; for "diarrhea for four or five days," it was 38 percent. Meanwhile, comparing the annual rates of hospital admissions per 100 persons suggests that Medicare and Medicaid had a tangible impact on widening access to health care. In 1963, the rate of hospital admissions for patients with private insurance was 15 percent, compared to 9 percent for those without private insurance. By 1970, the rates had equalized at 13 percent each, with the rate for those without private insurance increasing due in part to expanded access through Medicare and Medicaid. "Many people in the U.S. prior to 1965 had very limited access to medical care," said Ronald Andersen, an emeritus professor of health services and sociology at the UCLA School of Public Health who has studied this data since the 1960s and provided the data to us. "This situation improved considerably after the implementation of Medicare and Medicaid."